"La Casina Toscana" on talo noin 100 neliömetriä henkilöä, jonka juuret juontavat yhdeksästoista luvulla. Kauniisti kunnostettu maalaistalo tarjoaa kävijöille mahdollisuuden nauttia rauhasta Toscanan maaseudulla katsomassa upea panoraama Val di Chiana toisaalta ja toisaalta kaupungin Montepulciano ehkä makuista lasillinen hyvää viiniä vintage "Nobile" in rentouttava puutarhassa. Sijaitsee erinomaisella sijainnin ansiosta asiakkaat voivat päästä historiallisessa keskustassa Montepulciano lyhyen kävelymatkan: se sijaitsee vieressä hissi, joka johtaa kaupungin julkisia puutarhoja, lähtökohtana kävellä vanhassa kaupungissa, josta löydät lukuisia kauppoja ja ravintoloita ja nauttia taiteen ja kulttuurin kaupunki Montepulciano. Lyhyen matkan päässä ovat linja-autoasema, lähtökohtana useita linja suoraan tärkeimmistä kaupungeista, kuntosali, tenniskentät, jalkapallokenttä, supermarket, turistikohde, jossa polkupyörän vuokraus. Kaikki tämä tekee "La Casina Toscana" ainutlaatuinen, koska se mahdollistaa sen asiakkaat voivat pysäköidä auton pihalla tai huvimaja kuuluu yksinomaan tarjotaan ja siirtyä jalka tai julkisilla liikennevälineillä, jotta ne voisivat pysyä täydellistä rentoutumista. Hyvät yhteydet, se on ihanteellinen matkoja maihin, kuten Montalcino, Pienza, Cortona, Chianciano, Asciano, Siena, Arezzo, Perugia ovat kaikki alle tunnin ajomatkan. Valtatie ja rautatie asemalle Chiusin, Montepulciano yhteyden kaupungeissa kuten Rooma ja Firenze ovat vain 20 minuutin ajomatkan päässä. keittiö on hyvin varustettu kaikella mitä tarvitset (ruukut, lasit, pannut, jne.). Cozy home base for exploring Tuscany! I just finished a 5-night stay at Casina Toscana with my husband, my 8-year-old daughter, and my parents. We arrived at the house to find a welcome bottle of wine on the table, and Davide stopped by with lots of helpful suggestions for dining and touring in the area. It was easy to access both the old center of Montepulciano and to drive out to day trips in other parts of Tuscany. The house was also conveniently located to a grocery store and equipped with a kitchen so we could do some meals at home. From the yard, we had beautiful views of both Montepulciano and the whole valley. 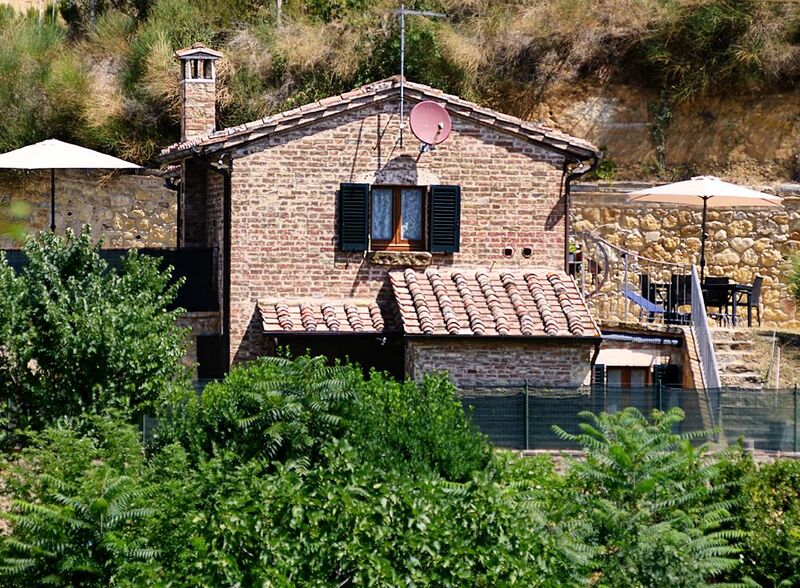 The house was everything we hoped for our stay in Tuscany, and we hope to return soon! Davide and his family have paid attention to every detail in this newly renovated home. The surrounding yard and outdoor living space is beautifully attended to. The scenery of Tuscany and the town of Montepulciano is visible from every room. The home is walking distance to the old town. Davide was attentive to our needs, gave us great restaurant and tour suggestions along with a history tour of the home. Three bedrooms in the home are all beautiful, the kitchen and living area are full of family character. I cannot say enough about this property. Pros: Great location. Very clean. Very well decorated. Excellent maintenance. Lovely outside areas (3). Wonderful and attentive host. Wifi very good. Cons: Bring your own spices and condiments. Kitchen small. My wife and I stayed here for 12 nights in October. Thoroughly enjoyed ourselves. It is very close to the walled city of Montepulciano, although the walk is steep. Supermarket only several hundred yards away. We wouldn't hesitate to highly recommend this property. We love La Casina Toscana like a second home. The fall visit was our second time there -- and we treasure the quaint but spacious restored farmhouse like a second home and Davide, the owner like a member of the family. We've already booked the entire month of October 2019. That's how much we love it. And here's why. Staying just outside the ancient gates of Montepulciano allows us to get a taste of agrotourism while enjoying the benefits of being within easy walking distance of everything we want and need. In fact, the walkability of the experience made it so special; daily walks to the market in town and back, daily hikes through the adjoining olive groves, exercise romps down the scenic byways around La Casina -- it's all an experience to be savored and treasured. We can't wait to get back! This is a lovely little property, I say little but it's 3 full bedrooms with A/C in each room. It's private even though the neighbors are close by. And the neighbors were quite friendly as well. The place was very clean and more than adequately furnished. It's close to town and a grocery store. The scenery surrounding the villa is spectacular, as is all of Italy, really. It's reasonably quiet and within range of the town's church bells which I found charming. Davide was a wonderful and helpful host with excellent communication. I very well may return to visit and I suggest you do too if you want a good jump off point to visit Tuscany! Many thanks for your kindness! It was a really pleasure share my house with you! I hope to welcome you again in the future! Thanks for everything! Location is a 10 out of 10. walk to town, walk to grocery store. comfortable bed and utilities are good. only downside is a steep driveway if your not so handy with Manual transmission. The driveway that goes down from the main road to the house is a bit steep to travel with the car, for this reason always recommend to park in the nearby private garden that is located at street level, although most of people come down directly to the house with the car without any problem. On the other hand it is not easy to find an independent house so close to the historic center with private parking! Also Montepulciano is a place in the hills, it is normal to find roads up and down! Thanks for everything! I hope to welcome you again soon!